The perfect dessert for the 4th of July! Spread fruit in bottom of greased 9 x 9-inch pan. If the fruit isn’t very sweet, sprinkle with 2 to 4 tablespoons sugar or substitute. There’s no need to thaw the fruit if it is frozen; the cobbler will just have to cook a bit longer. Place butter, sugar, flour, salt, and baking powder in bowl of food processor. Process until butter is completely cut into flour mixture. Add milk and pulse-process just long enough to mix it all together. Spoon batter over fruit. Bake at 350°F. for 45 to 50 minutes, or until the topping is nicely browned and fully cooked, and the fruit is bubbly. Serve warm with vanilla ice cream, whipped cream, or cold, sweetened table cream. Goes best with fireworks. 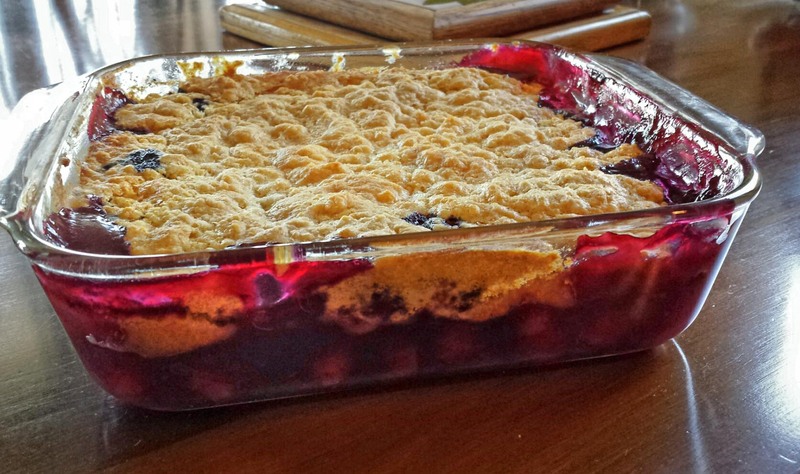 This entry was posted in Dessert, Recipes and tagged 4th of July, berry, cobbler, dessert, fruit, no sugar added, recipe. Bookmark the permalink.